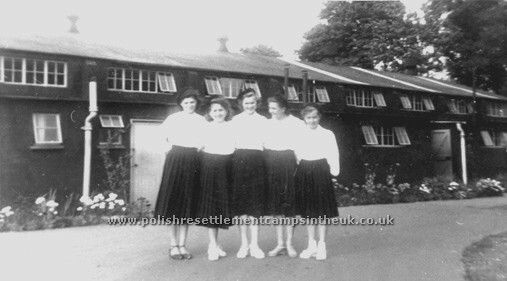 KEEVIL POLISH CAMP in Wiltshire. RAF Keevil a former World War II airfield sandwiched between the pretty villages of Steeple Aston and Keevil and about 4 miles east of Trowbridge in Wiltshire. Like most WW 2 airfields it was built on requisitioned land in 1941 under emergency powers with the intention of returning the land to its owners when hostilities ceased. The airfield had 3 runways and their associated buildings. 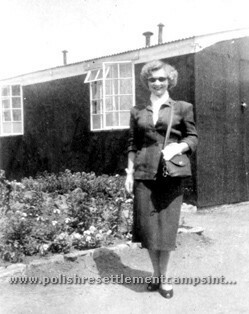 There were several sites of typical wartime design providing basic accommodation, catering facilities, offices and workshops. 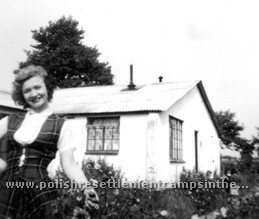 After the war some of the accommodation sites were acquired by the National Assistance Board for housing Polish Displaced Persons and the camp evolved much the same as all the other Polish camps that were scattered throughout the UK in the 1950s and 1960s eventually closing some time in the early 1960s. 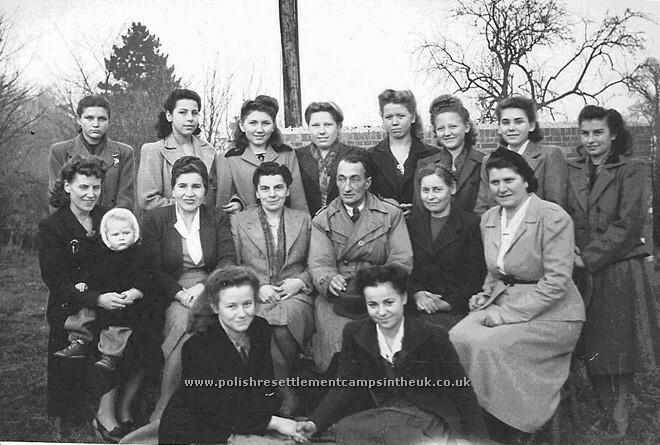 Many of the inhabitants moved to near by Trowbridge establishing a new Polish community. 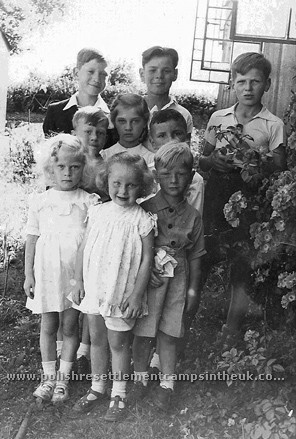 Some of the people, Ludwika Świderska, Kazik Brzezicki, Józef Murjas, Antoni, Józef and Marysia Bogdaniec. Some of the barrack used as living accommodation in the last photo you can just make out some nissen huts. 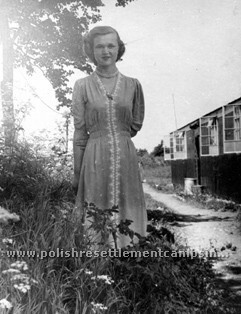 Marysia Bogdaniec outside her hut. Thank you to Maria Polkowska nee Bogdaniec for the above photos from Keevil. 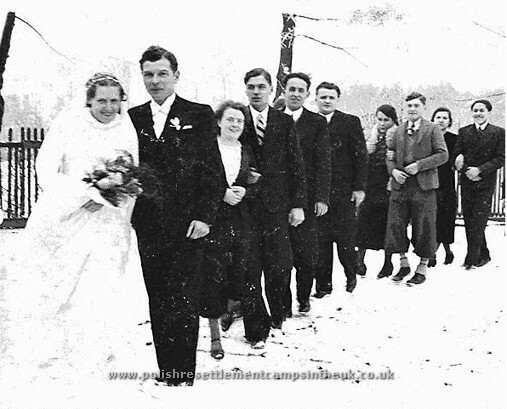 Our parents Pelagia Sokołowska & Wincenty (Vincent) Kapica were married in Poland on the 26th December 1937. 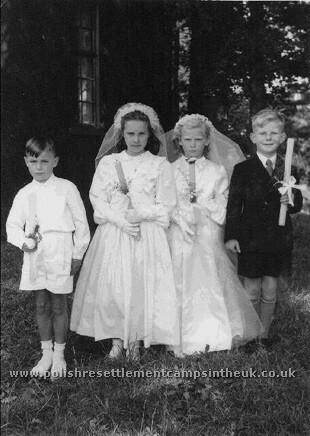 Their happiness lasted for just under two years when WW2 started and dad went to war. He went through Rumania to join the army in France and then on to Scotland as a member of 1st Polish Armoured Division (Pierwsza Dywizja Pancerna). He left his young bride, just a few months pregnant, to go and fight for the freedom of Poland. 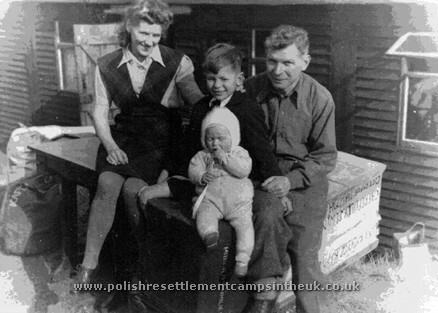 My brother Andrzej was born in March 1940, during the German occupation, having lots of aunties to fuss over him, as most men were at war. The war ended in 1945 and Dad is now stationed in Germany from were he goes to Poland to find his wife and son. He finds Pela and Andrzej at his parent’s home in Myszkow and they could hardly believe that he was alive and well - they are reunited. Then after two attempts he managed to smuggle them out of Poland to Germany. 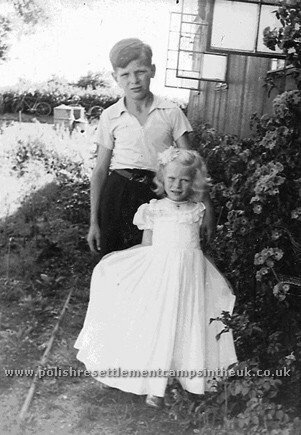 I was born on April 1947 in Loningen Germany. 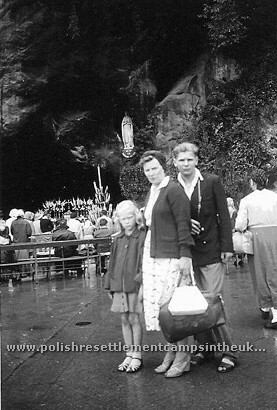 He then made a vow that once their life is settled he will take the family on a pilgrimage to Lourdes. 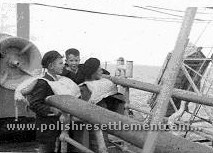 In September 1947 Mum, Andrzej and I sail from Hamburg to Glasgow, 5 days at sea. We are initially accommodated in Haydon Park (17th September 1947 to 16th March 1948) and when Dad arrived months later we move to Tilshead. That was the first time that we were together as a family in England. Andrzej on the right sailing from Hamburg to Glasgow. In 1948 we moved to Keevil near Trowbridge and life returns to normal. We have a vegetable patch as well as a few chickens to supplement our diet when most food is rationed. Dad travels to Melksham to work in the Spencer Steel factory. 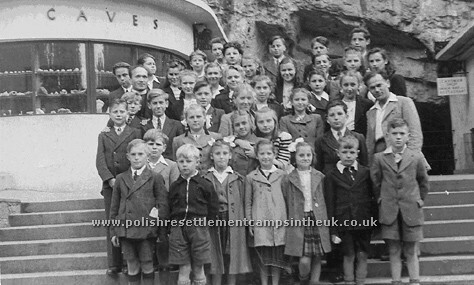 The camp, consisting of half a dozen sites, is like a little Poland with our own priest Rev Czarniecki, school and doctor all in the camp. My class at Keevil camp. Some of the names I can remember. Juerk and Bolek Ryzop, Tadek Szafran, Józio and Marysia Czerniachowicz , Jurek Nierzankowski, Basia Dąbkowska, Jadzia Grońska and me. A group of friends including my brother, Andrzej who is in the back on the right. Jacek Białobrzeski, Jurek Ryzop, Joasia Białobrzeska, Basia Dąbkowska, Bolek Ryzop & me. The authorities in all NAB camps laid on adult education classes not only in learning the language but also in practical skills. Dressmaking and sewing classes were very popular. 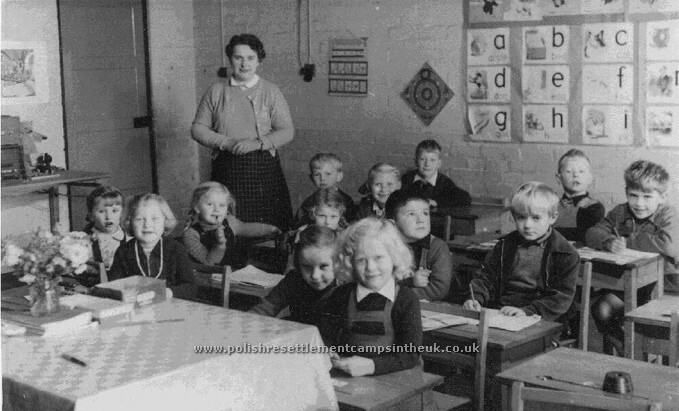 Sewing class members run by Mrs Mariampolska, her daughter Karolina subsequently married Mr. Ryszard Kaczorowski who became the “Ostatni Prezydent II Rzeczpospolitej” (Last President in Exile of the 2nd Polish Republic). 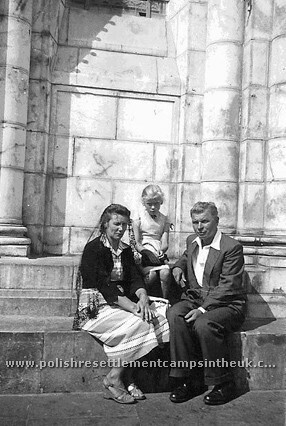 Other people are people are Pelagia Kapica holding her daughter Wanda, Celina Sieradzka, Krystyna Lipinska, Kazia Rabczak, Janka Czerniecka, Marysia Jankowska, Mr. Horyński, Czesia Dendura, Misia Gnyp and Irena Brzezicka. 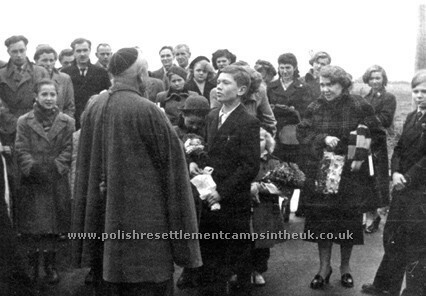 1958 – Most of the Polish resettlement camps were closing down and we went to Swindon to run our own delicatessen shop. 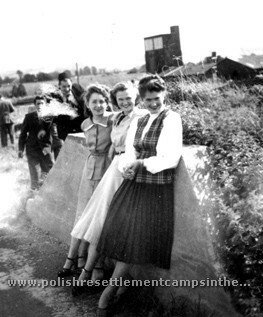 Most of the other people from the camp were settled in Trowbridge. Running the shop was hard work but very satisfying, Mum ran the shop while Dad operated a mobile shop supplying all of Swindon and going as far as Trowbridge and Melksham. 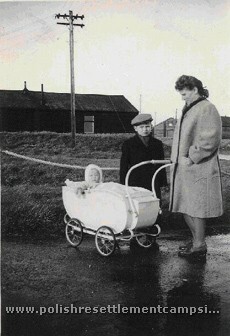 1968 – Dad died suddenly of a heart attack and Mum and I continue in the shop for another 10 years. Mum then retired but still continued to be in charge of the kitchen/restaurant at the Polish Community Centre for many years. She is now 93 years old and is living in Ilford Park Polish Home in Devon and where she is very well looked after. Thank you to Wanda and Adam for their story and photos. 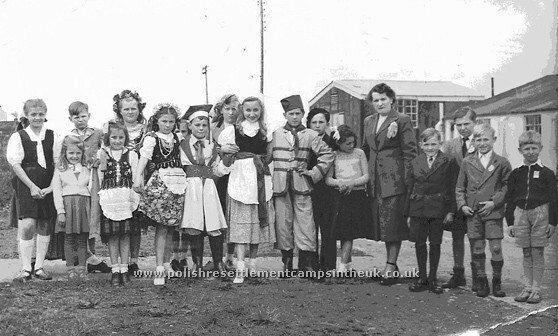 If you lived in Keevil and have photos and memories of life in the camp please get in touch.